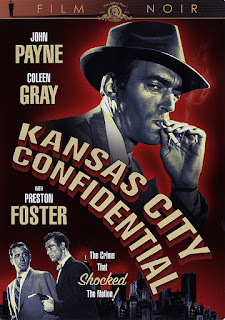 Kansas City Confidential (1952), a movie about an innocent man caught up in a heist who must then fight to clear his name, has to be an interesting case study in the conflicting pressures American movie makers faced in the 1950s. On the other, the movie's love interest and redemption-soaked ending are so thoroughly unconvincing, so obviously at odds with everything else, that it's easy to disregard them and to enjoy the good stuff. The gulf between the redemption and the evil got me thinking about, and appreciating, the balance that moviemakers of the time must have had to strike between getting their dark visions on the screen, and making them morally acceptable in a conservative age. Maybe the era's social pressure to clearly delineate good and bad is responsible for the movie's splendid trio of heisters, played by Neville Brand, Jack Elam, and a young Lee Van Cleef. These guys are like crowd figures in a Northern Renaissance Crucifixion painting. You know they're evil just by looking at them. Perhaps the most enjoyable thing about Kansas City Confidential for crime fiction readers is spotting the bits that Donald Westlake had to have picked up from the movie: The discord among criminals. The getaway car that drives up inside a tractor-trailer after a heist. The caper masterminded by a disgraced former high-ranking police officer, a device Westlake used to great effect in The Score. The movie's narrative arc is also similar to those of many of the Parker novels Westlake wrote under his Richard Stark name: We see a robbery being planned, but the real action happens after the heist. 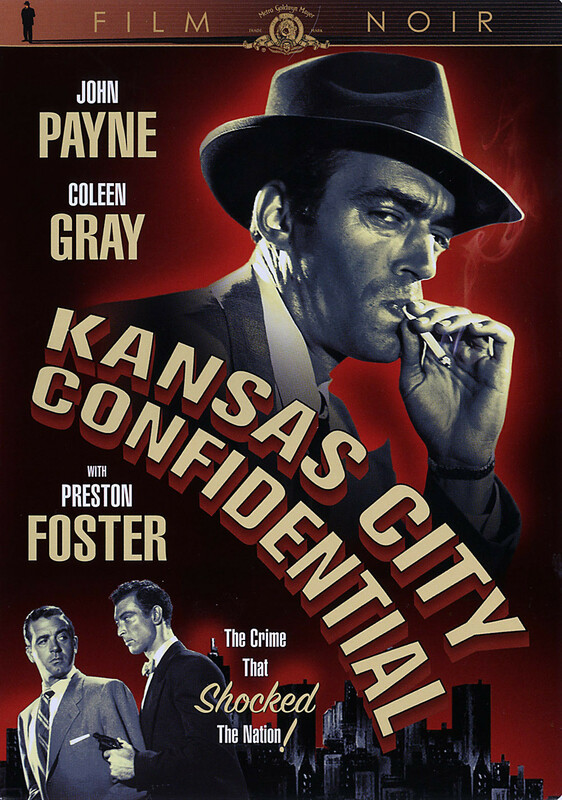 I wouldn't call Kansas City Confidential a heist film, though, because the pre-heist planning part of the story is given little attention. I own the collection and just checked the index (it's of names and titles only, which makes it a little hard to use). 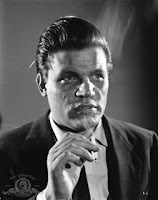 I couldn't find it easily so I tried searching for Kansas City Confidential within the book at Google Books. No hits. You're right, though. The trailer and the discord are things Westlake used. I have the book at home, so I can look for it later. Westlake loved the trailer thing so much that he not only used it in the Parker novels, he had fun with it in the Dortmunder books. Westlake wrote about his appreciation of Big Deal on Madonna Street, so he knew his 1950s heist movies. These would have been the movies in theaters when Westlake was a young man, just about to get started as a writer, so he very well could have had them in mind when he wrote his own books. Everything you credit the movie for Westlake picked up from the novels of Lionel White. That doesn't rule out the film's contribution to the Stark books but if you read White's caper novels you'll see where Don came from. Read THE MONEY TRAP by White and then read COPS AND ROBBERS by DW. Different plots but you still seen the influence. All that said Don improved on White many thousand times over. I tried to read CLEAN BREAK some time back and could not get past the opening scene's clumsy wordiness. I do like The Big Caper's nod to Hammett. I liked Cops and Robbers, so I'll be happy to seek out its influences. Ed: You obviously know more about this stuff than I do, but I see that White's first novel appeared right around the time this movie came out. I wonder how much White and other Gold Medal and other paperback original writers were influenced by movie melodramas of the 1940s. "The Money Trap" appears no longer to be in print, but I'll keep looking. I like heist stories, or maybe I just think I do because I like Westlake so much and because I'm a fan of "Big Deal on Madonna Street," which was a Westlake favorite. Those Gold Medal writers must have been a motley lot. My favorites among the bunch are Charles Williams and Peter Rabe. I'm not sure if they lifted their material from anywhere, but if they did, did so so graceful and smoothly that they created something new. Westlake did the same, I suppose. When the soldiers came back from WW11 and sat down to write commercial fiction they brought their war experiences to bear on their material. Peter was a good friend of mine. Between the anti-Semitism he suffered as a boy and the black market and corruption he saw in Europe--and then America--after the shooting stopped, he knew what he wanted to write. A whole new kind of shooting commenced. I can well believe that Rabe may have been the most original of the paperback original writers. Among other things, he should be known as the crime writer who brought psychology to bear on his stories, not that wince-making amateur Ross MacDonald. I presume this was due to Rabe's own background in psychology. Here's s short piece I wrote after what I think were the first two Rabe novels I read. I haven't read any of the Daniel Port books, though. They're pretty high on my to-read list.